There is no fishing net in the west of Jizo-saki Point this time. 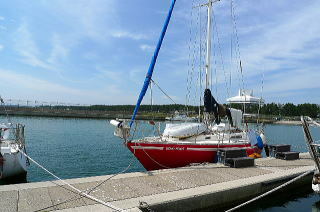 The fee is now JPY1,800/day for a boat shorter than 10 meters. The fee of the public bath house is now JPY700. The Japanese style toilet on the 2nd floor is now available at night. An electronics shop YAMADA opened nearby though, it is not crowded. Because, people are going to a market PLANT 5 ( www.plant-co.jp ), which also has a fish shop with reasonable priced local good fishes. There is a fishing net in the west of Jizo-saki Promontory, which should be on your right on the way to the marina. My route plan which is the red line on Google map has no problem. From a long distance, you will see a silver sphere building and a circular tower. Head to the left side of them. Sakai-ko Port has No.2 breakwater which surrounds the port like a long wall, as you see on the chart or the port guide (i.e. Japanese S-Guide). Passing by the south end of the breakwater to your right, you head to the marina’s entrance lighthouse which is red at 35 30.870N 133 15.260E. Take a course as close as possible to the lighthouse to avoid the shallow sand area located in the south of the lighthouse; and then turn around into the marina. In the marina, there are comb-like three pontoons with boats. I had moored my boat at the west (left) back tiger-striped quay though, a marina guy guided me to the most outside pontoon. A VP of a yacht club, Terasawa-san, kindly taught me things around the marina. All marina facility is locked at night. You may enter from the back door with key numbers. No entering into the building, which has toilets. There is a public toilet at a camping area three minutes walk away. Provisions: There is a big super market with reasonable priced variety of goods 7 minutes walk away. The market also has stores of do-it-yourself, books, clothes and so on. Local people were driving to here for shopping. No fuel service in the marina. Power is available at the pontoon. Opening the floor with a key, water is also available at the pontoon. 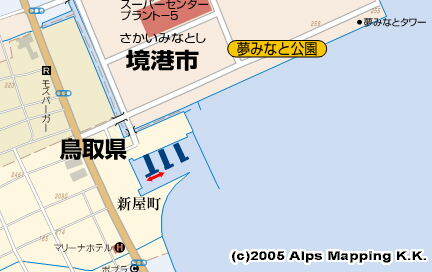 There is a public bath house (Onsen) next to the silver sphere building for JPY500. I put up the boat on the cradle and newly painted the bottom. Terasawa-san kindly allowed me to use a cradle free. As the marina employees were moving only cradles, you can’t put up the boat even if you have a cradle. A boat owner Mura-san kindly helped me to complete my painting works. Without him, I didn’t do anything. As you see the picture on the cover page above, a shallow sand beach is sprawled in the south of the marina. “Ko” of Sakai-ko means “port” in Japanese. “Minato” also means “port”.